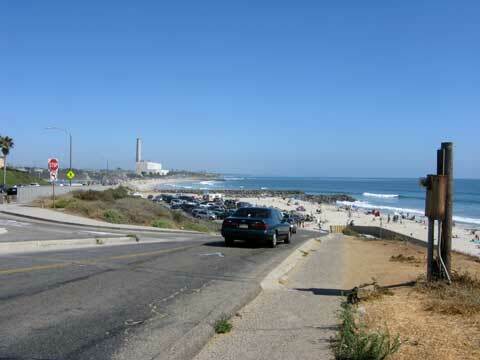 Carlsbad State Beach in the San Diego Area includes popular Tamarack Beach in Carlsbad CA. The long beach stretches for over a mile and has a new concrete boardwalk/seawall. Carlsbad Tamarack beach is popular with locals and tourists. The beach is close to all the top Carlsbad attractions including Legoland, Sea Life Aquarium , Carlsbad Flower Fields, and the Carlsbad Premium Outlet Mall. Nearby is also The Wave Waterpark in Vista and the California Surf Museum in Oceanside. Parking: Free parking lot at end of Tamarack Avenue, and free parking along Highway 101. Getting There: Short walk to the beach from parking areas. Also the long Tamarack Beach boardwalk offers great access by bicycling, roller blading, and jogging. Things to Do: Walking, jogging, roller blading, sunbathing, swimming, bodyboarding, surfing, beach volleyball, picnic in a grassy park. Facilities: Restrooms, showers, changing rooms, trash cans, concrete boardwalk and seawall stretches for about 1 mile along the beach. Services: The south end of the beach does not have many services, but at the north end and near Carlsbad Village you can find many restaurants, bars, surf shops, rental shops and vacation rentals along the beach. High Tide Access: Good beach at low to moderate tide; at high tide, the beach can disappear. Dog Rules: No dogs allowed on Carlsbad State Beach, but dogs are permitted on the upper walkway. Hazards Carlsbad State Beach: Rip currents. If you are looking for a Carlsbad beach front hotel, try the Tamarack Beach Resort Close to all the Carlsbad attractions including Legoland, Sea Life Aquarium , Flower Fields, and Carlsbad Premium Outlet mall, you can walk across the street to the nearby Tamarack beach. 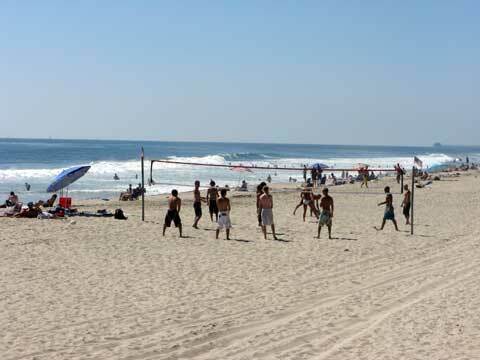 South Carlsbad State Beach (better known as Ponto) is a favorite for local surfers. South Carlsbad State Campground is a popular San Diego beach camping spot for tent and RV camping. Carlsbad State Beach Tamarack Beach Driving Directions - From Interstate 5 in Carlsbad, go west on Tamarack Ave. to the Pacific Ocean. There is a parking lot at the end of Tamarack Ave. It the lot is full, you will need to find parking along the street. Directions to Carlsbad Beaches by Train - You can easily reach Carlsbad State Beach (Tamarack Beach) from the San Diego Coaster Train. 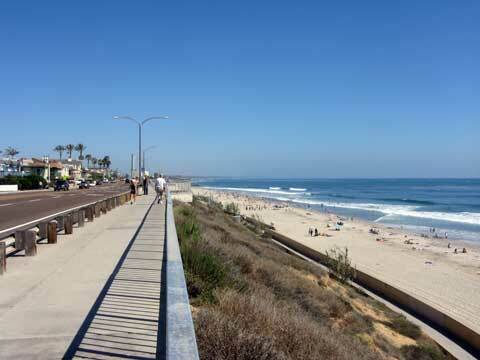 The beach is 3 blocks from the Carlsbad Village train station. Note: The Coaster trains have limited service on Saturday, Sunday and holidays, so be sure to check the current train schedule.